Genetic diseases cause great physical effect to newborns and psychological impact to parents. 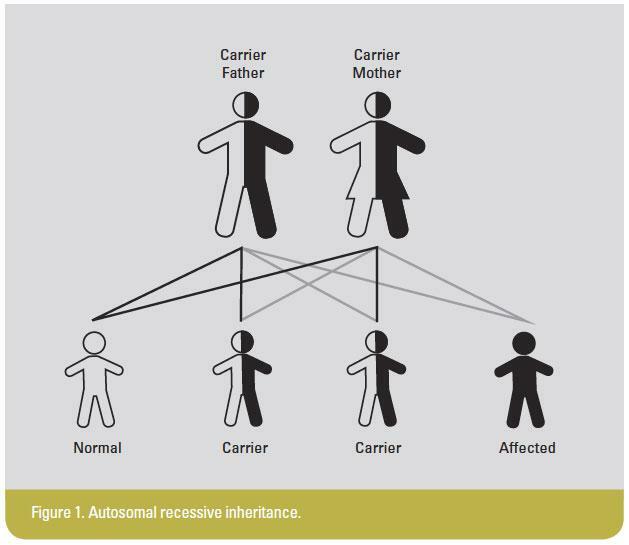 Recessive genetic diseases can hit asymptomatic carrier couples with detrimental impact because very often they are not aware of their carrier status. Recessive genetic disease affects at least 30 in every 1,000 children, ranging from very mild to severe phenotype.1-2 Common examples of recessive genetic diseases include thalassaemia, spinal muscular atrophy, congenital adrenal hyperplasia, cystic ﬁbrosis, among others. Although newborn screening helps to reduce morbidity and mortality among the affected probands, options available to patients are still limited. 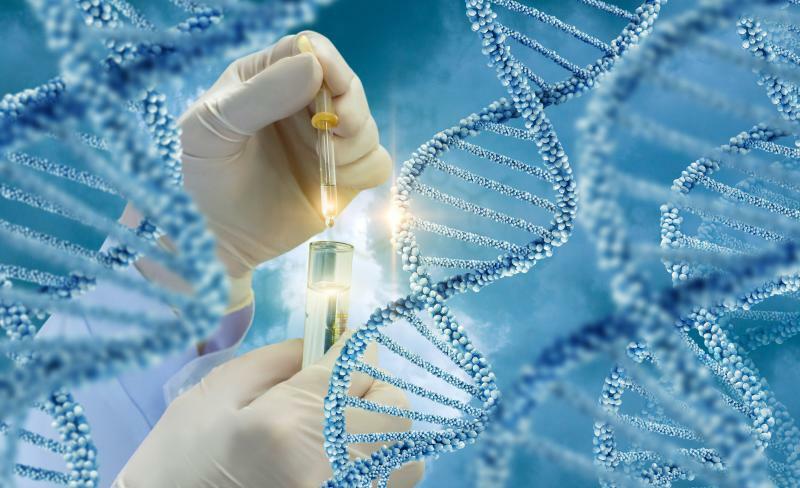 Genetic carrier screening aims at screening for carrier state in asymptomatic individuals, for determination of certain mutation, or abnormal allele within a known gene associated with a certain genetic condition. Carrier screening can be performed prenatally, or ideally during preconception, providing more reproductive options and pregnancy planning to carrier couples. This review article will present an overview through the era of conventional screening to the new age of genomic medicine, nondirective pan-ethnic approach by expanded carrier screening (ECS), current guidelines available, pros and cons of ECS, and areas of concern before implementation of universal ECS. Conventional genetic disease screening starts with a comprehensive family health history assessment. 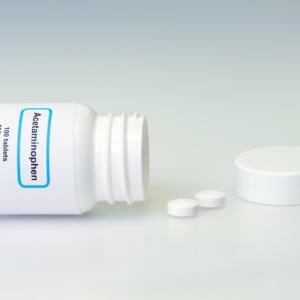 Its value has often been overlooked by medical professionals. However, it forms the basis and plays a major role in genomic medicine as genetic screening assessment.12 Genetic assessment is often not completed without a three-generation clinical history. A three-generation pedigree through clinical history provides a pictorial representation of genetic disorders in a family. It is efﬁcient in assessing hereditary disorders and mode of inheritance, guiding further investigations, and management plans. 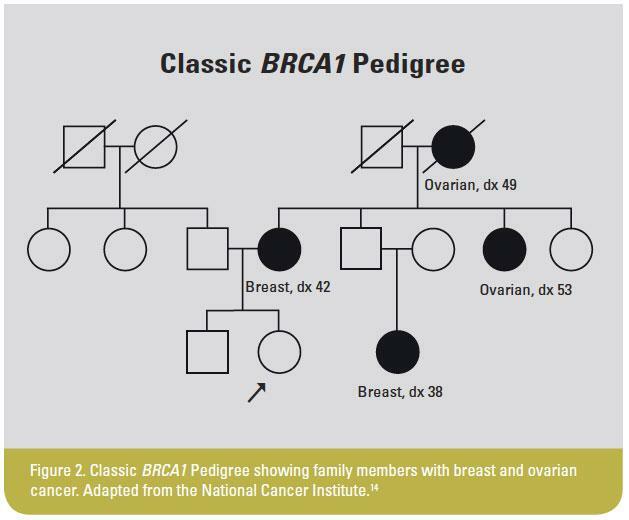 The Pedigree Standardization Task Force (PSTF) of the National Society of Genetic Counselors (NSGC) published a recommendation guideline in 2008 regarding the system of pedigree nomenclature to internationally standardize the pedigree.13 Figure 2 illustrates an example of a pedigree showing a family with BRCA1 pathogenic variant across three generations. Conventionally, various international bodies recommend genetic screening of different health conditions based on ethnic-based approach. The most well-known international bodies with established guidelines include the American College of Obstetricians and Gynecologists (ACOG), American College of Medical Genetics and Genomics (ACMG), National Society of Genetic Counselors (NSGC), Society of Obstetricians and Gynaecologists of Canada (SOGC), and the Canadian College of Medical Geneticists (CCMG) in (Table 1). 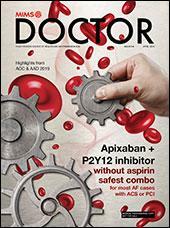 Both ACOG and ACMG recommend pan-ethnic screening of CF and spinal muscular atrophy. However, Canadian guidelines recommend screening at risk ethnic background only or history-based risk factors for CF, as well as history-based screening of Fragile X syndrome. This is due to the lack of laboratory infrastructures and clinical and counselling resources in Canada.15 Screening for other recessive conditions are mostly ethnic-based or history-based. Ethnic-based screening may be replaced by pan-ethnic universal screening in the near future. The major reasons for such change are due to changes in social structures and population mobility resulting in multiracial societies worldwide. These changes called for replacement of ethnic-based carrier screening by a universal screening. Development of cutting-edge technologies leads to reduction of costs for DNA analysis and sequencing, resulting in rapid evolvement of genetic testing technologies like panel-based high throughput next generation sequencing (NGS). Genetic carrier screening by high throughput NGS is termed expanded carrier screening. International bodies such as the ACMG and ACOG have changing views on expanded carrier screening through the years. In 2013, though technically and financially feasible, the ACMG position statement discouraged universal screening by expanded carrier screening until further guidelines are made available.28 A joint statement by ACMG, ACOG, and NSGC in 2015 published guidance on expanded carrier screening, stating its acceptability as a carrier screening test in view of the increasing multiracial society. However, they also cautioned healthcare professionals against the complexities of offering expanded carrier screening and urged for special consideration prior to implementation.29 Following the increasing acknowledgement of expanded carrier screening from the previous joint statement, ACOG published a committee opinion in 2017 stating that ethnic-specific, pan-ethnic, and expanded carrier screenings are all acceptable strategies for prenatal, pre-pregnancy carrier screening.30 Apart from increasing multiracial societies, reduction in cost for genetic tests also contributes to its rapid evolvement and uptake. Although all strategies are acceptable, each healthcare profession should provide a standard and consistent approach to each patient to avoid confusion. Expanded carrier screening using high throughput NGS can screen for a panel of recessive genetic conditions, ranging from 3 to >200 genetic conditions depending on the panel used. The aims of detecting asymptomatic carriers in prenatal or pre-pregnancy period are to reduce the possibility of having an affected newborn, to reduce the need for prenatal invasive testing which imposes risks to pregnancy as well as emotional and ﬁnancial burden, and to reduce the need for diagnosing genetic condition after delivery. Prenatal carrier screening enables couple to decide whether they need prenatal invasive testing to diagnose affected foetus, for reassurance of not having an affected pregnancy, for better preparation of the birth of affected child, or an informed decision on having to terminate the pregnancy. Ideally, pre-pregnancy screening would be preferred over prenatal screening. Information available before pregnancy allows more reproductive options, such as adoption, use of donor egg, sperm or embryos, remaining childless, or pre-implantation genetic diagnosis to avoid replacing embryos with the affected condition. The aim of expanded carrier screening is to identify at-risk carrier couples thereby optimizing their reproductive options. A retrospective modelling analysis carried out in the multiracial US recruited 346,790 individuals of reproductive age for screening of up to 94 severe or profound genetic conditions using expanded carrier screening. It was found that expanded carrier screening modelled 159.2 per 100,000 foetuses at risk for severe or profound conditions compared with only 55.2 in 100,000 hypothetical affected foetus using conventional guidelines-based screening panels.31 Although further prospective studies are needed before adopting universal expanded carrier screening, the study showed that expanded carrier screening may increase detection rate of recessive genetic disease carriers than conventional ethnic-based screening in a multiracial society. To determine the inclusion criteria of genetic diseases to the universal panel, one needs to know the prevalence in order to aid cost-effectiveness. Lazarin, et al, using a targeting-genotyping panel, screening for more than 400 mutations of 108 genetic conditions showed that 24% of subjects carry at least one mutation, and 5.2% were screened carriers for multiple disorders. Compared with traditional ACOG screening guidelines, 76% of these mutations would be missed if the panel was not used.32 Abuli, et al, recruited 1,301 patients taking part in the gamete donation program and screened for recessive genetic mutation using an NGS-based assay. The assay used can screen for 368 genetic conditions and 200 genes. About 56% of individuals were found to be carriers of at least one genetic condition, and 3% of assigned gamete donations were rearranged as the potential donors and recipients matched were carriers of the same genetic mutation.33 Martin, el al, screened for 2,570 individuals using NGS-based panel, which included 549 recessive and X-linked genetic conditions. At least one pathological variant was found in 84% of individuals.34 The three studies showed differences in the detection of genetic mutations using different panels. With a panel including more genetic conditions, a higher yield of mutations will be identiﬁed. Whether a wider panel is better than a panel with less genetic conditions remains an argument which will be further discussed in the later part of this review. 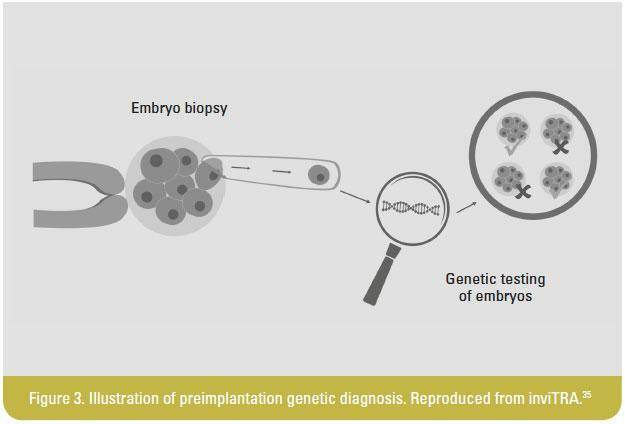 Pre-implantation genetic diagnosis (PGD) is an important milestone in the history of assisted reproduction (Figure 3). PGD enables detection of embryos with genetic mutations using various genetic tests, thereby selecting healthy or unaffected embryos to be replaced while discarding the affected ones. With expanded carrier screening, more carriers of genetic diseases will be identiﬁed, thus more couples will be seeking help from assisted reproduction such as PGD. The evidence on the role of expanded carrier screening in assisted reproduction is still limited, although some studies have shown that using expanded carrier screening with NGS-based panels will alter management in patients seeking assisted reproduction treatment. A cohort study involving 6,643 individuals from a single infertility centre from 2011–2014 showed that 25.1% of the individuals had a positive test result for at least one mutation. Among the participants, 1 in 2,000 couples tested positive for the same genetic disorders and thus managed differently.36 Caroline, et al, retrospectively analysed 537 at-risk couples who had the same recessive genetic disease, and it was shown that the disease severity correlates with changes in decision making. It is not surprising that patients are more likely to change their management if the screened condition is severe. However, the cut-off in determining mild, severe, and profound conditions is arbitrary. The criteria used in the above retrospective analysis differ from the criteria for severe and profound disease recommended by professional society screening guidelines.37 Classiﬁcation of disease severity ought to be more standardized in future to avoid confusion and unmatched expectations between healthcare professionals and patients. With the increasing use of expanded carrier screening, foreseeably more couples will be subjected to PGD as expanded carrier screening has a higher detection rate of mutation compared with conventional screening. Due to the wide variety of genetic disease with expanded carrier screening, with inclusion of genetic conditions where penetrance is variable or unpredictable phenotype, it cannot be guaranteed that all couples with mutations detected can be eligible for PGD.38 Martin, et al, screened 2,570 individuals with expanded carrier testing. About 4,925 deleterious variants were found, and additionally, 35,537 variants of unknown signiﬁcance (VOUS) were identiﬁed. Patients with VOUS traditionally are not eligible for PGD. However, with increased use of expanded carrier, it would be more common to detect VOUS of same gene couples. Further studies and guidelines are needed for management of these couples, as these could cause unnecessary anxiety to patients seeking assisted reproduction and who are aiming for a healthy baby. 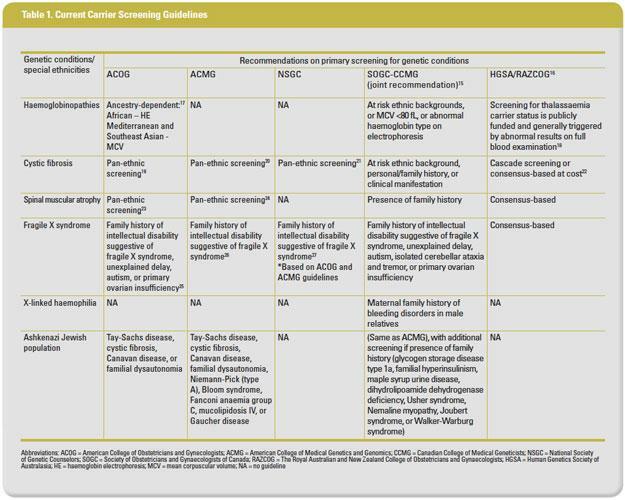 The ACOG stated that ethnic-specific, pan-ethnic, and expanded carrier screening are all acceptable strategies for pre-pregnancy or prenatal carrier screening.30 The biggest hurdles for the implementation of expanded carrier screening are time and knowledge required for pre- and post-test counselling and subsequent logistics, as well as problems arising from conditions included in different expanded carrier screening panels available commercially. Expanded carrier screening panels include multiple genetic conditions, up to more than 300 genetic conditions. In view of the complexity of the multitude conditions screened, pre-test counselling is crucial to prepare patients psychologically for the possible outcomes. Patients should understand that even with a screened-negative result, they still have a residual risk of genetic diseases screened due to possibility of false negative. It is important to acknowledge that the prevalence, detection rates, and estimation of residual risk for some of these conditions screened may be less accurate due to the rarities and scarcity in data. For the same reason, certain rare genetic conditions screened may have less well-deﬁned phenotype. Patients being counselled on expanded carrier screening should also be made aware that the screening panels may change over time and the conditions included within the panel may differ in-between laboratories. Post-test logistics are also important. One’s partner must be screened if a woman was found to be a carrier of an autosomal-recessive condition. If both couples are screened positive for an autosomal-recessive condition, their offspring will have a 25% risk of being affected. The couple should be referred to trained genetics professionals for counselling. In pre-pregnancy situations, depending on the severity of screened-positive genetic condition, PGD can be considered. In prenatal setting, choice of prenatal diagnosis shall be offered. One would have brought up the issue of conﬁdentiality when both couples are screened positive for the same recessive genetic condition. Janssens, et al, interviewed 16 geneticists and found that most geneticists felt comfortable in providing individual test results to couples. On the contrary, there was one geneticist who felt uncomfortable in providing the genetic test results to the couple as the information may potentially lead to a change in the couple’s relationship.39 Apart from the issue of conﬁdentiality on the result-disclosure, ethical issues also need to be considered. Take alpha-thalassaemia carrier couple as an example — an affected foetus can be hydropic leading to mirror syndrome with severe pre-eclampsia and pleural effusion in women. As women are the ones carrying the foetus, many will argue that they have the right to know their partners’ screening results. While debates on result-disclosure issues go on, the joint statement by the professional bodies in 2015 suggested that the carrier screening results should be made available to the patient, and relatives should be informed of the availability of carrier screening through written information.29 Before more guidance are available, consents obtained from the couple during the pre-test counselling, including result disclosure to both the women and her partner, appears appropriate. · Carrier detection rate of more than 70% in at least one well-studied population, where consanguinity is not common, as risks calculated would be overestimated in populations with consanguinity. · Carrier prevalence of genetic condition should be at least 1 in 100 in at least 1 well-studied population. The risk of affected pregnancy would then be less than 1 in 400 before partner-screening, which is similar to the risk cut-off in conventional prenatal screening such as Down syndrome. · Adult-onset diseases should be excluded. · Conditions with data only available in poorly-studied population should be excluded, as the calculation of carrier prevalence and detection rate may be inaccurate and cannot be generalized universally. · Genetic conditions with unknown prevalence, incomplete penetrance or mild phenotype should not be included in the expanded carrier screening panel, as even if screened positive, couples are unlikely to consider invasive testing as the condition may not have detrimental effect on the quality of life, ie, a beneﬁt in terms of reproduction planning. 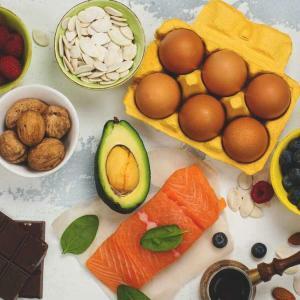 With the rapid evolvement in technology and reduction in cost, different panels of expanded carrier screening have been widely commercialized. Although expanded carrier screening may seem attractive, the wide variety of screening panels yield inconsistent results. This imposes great difﬁculties for the healthcare professionals to decide on which panel to choose. Moreover, the commercially available panels include numerous conditions, some of which are of very low frequency. These conditions may have low or unknown testing sensitivity due to its limited data, thus leading to inaccuracy in prediction of residual risk. These commercially-available screening panels may also include conditions that are mild or with incomplete penetrant phenotypes, in order to attract customers. However, screening for conditions that may not be necessary, for example, those with mild phenotype and does not affect quality of life, will lead to unnecessary stress, follow-up cost for testing and counselling. Blaire, et al, compared seven commercially-available expanded carrier screening panels with guidelines from professional bodies. Seventy-three percent of conditions on the commercially-available panels, which can be accessed by genetic professionals, did not meet the guidelines-proposed utility criteria.40 Apart from putting patients under unnecessary anxiety, time, money for follow-up testing, stigmatization, and confusion, the genetic professionals need to deal with post-test counselling. Geneticists may not be available worldwide and some countries may have fewer trained genetic counsellors. Further evidence is needed to decide the variety of conditions that should be included in the panel to reduce unnecessary burden on the medical manpower. Healthcare professionals also have to consider which commercial panel to undertake, taking the latest ACOG guideline into consideration. Consistency in providing the same panel to patients is important to avoid confusion and disputes. Professional and public education, as well as quality control, are the main barriers to implementation of expanded carrier screening universally.30,41 There are so far no consensus regarding the inclusion criteria of the genetic disease within the panel. It is best to develop an accredited service to review the qualities and clinical utilities of the commercial screening panels periodically, avoid public confusion, and ensure quality of the pre- and post-test logistics. Apart from quality control, education and manpower are also important prior to implementation. With the foreseeably increased uptake of expanded carrier screening, more carrier status of different genetic conditions will be identiﬁed requiring genetic counselling. Trained genetic counsellors will be in demand. Lazarin, et al, conducted a survey among 337 genetic counsellors of varying clinical ﬁelds, including 150 practising in reproductive setting.41 The survey showed 80% of the genetic counsellors are willing to undergo expanded carrier screening for themselves. However, only 40% of them will offer expanded carrier screening to less than a third of patients, and 52% will not offer expanded carrier screening to patients. From the survey interview, the main barrier to offering expanded carrier screening to patients is the time required for counselling and arranging follow-up logistics. From the survey, more than 20% of geneticists disagree with the statement “I am very knowledgeable about high-throughput carrier screening technology”, and more than 15% of them felt uncomfortable explaining genetic information that expanded carrier screening technology provides. This reﬂects the importance of training to equip geneticists and genetic counsellors on pre- and post-test counselling. This article gives an overview of evolvement in medical genomics from traditional targeted screening to nontargeted expanded carrier screening. In near future, nontargeted pan-ethnic expanded carrier screening may replace conventional targeted screening. This also signifies evolvement of diagnostic medicine in the future. With time, traditional targeted investigations for disease diagnosis may be replaced by nontargeted work-up because of lower costs of sophisticated investigations. However, further studies are required to scrutinize issues towards counselling, interpretation of results and genetic conditions inclusion criteria, quality control, availability of manpower, and education of professionals before implementation of nontargeted expanded carrier screening. Dr Heidi Hiu Yee Cheng is a Resident (Specialist) in the Department of Obstetrics and Gynaecology, Queen Mary Hospital, Hong Kong. Dr Anita Sik-yau Kan is a Consultant in the Department of Obstetrics and Gynaecology, Queen Mary Hospital, Hong Kong.